When "The Story of Us" opened in 1999, the critical disdain was so overwhelming, that my fiancee and I opted not to see it. 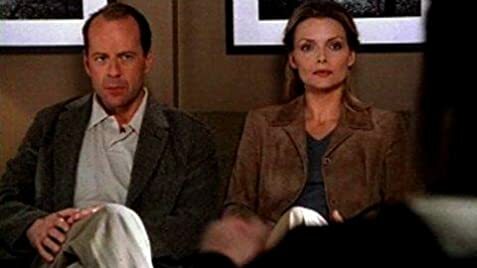 After all, the ads focussed on its romantic comedy aspects, directed by Rob Reiner (When Harry Met Sally), and starred Bruce Willis (who had just undergone a public divorce). In retrospect, it's easy to assume why it got panned... this is NOT a romantic comedy, although there are comedic elements. Those expecting a Harry/Sally II would be clearly be disappointed. Those expecting some insight to Bruce Willis' marriage, too, would be disappointed. The film is neither of those things. Of course, had the associations not existed, and the ad campaign refocussed its efforts, the film would be far better respected. That's why time will be very kind to this film. Not everything works. Some scenes, like the language of the women, are too profanity-laced to sound like real women (making David Mamet's writing seem like Jane Austen by comparison). There's a terrible scene with Willis in a restaurant--unrealistic, unfunny. Why then recommend the film? Because the agony, the depth of painful emotions, are real. Find a better acting job by Willis or Pfieffer. Find one!!! Can't be done. Do you not see it? Do you not recognize that this film has one foot firmly planted in the light comedy world, and another foot firmly planted in the incredible realism (almost too realistic) angst of a failing marriage? Do you not see it? Do you not hear Reiner's concerns projected in the scene where Willis requests to Reiser his dream of writing a book on his grandmother--is this not Reiner saying that he WOULD go further with the serious story here, but the audience, too set by his own past achievements, will not let him? Is this not exactly what happened, when _Story of Us_ was released? Don't be fooled. This is one serious movie. It should be required viewing for all engaged couples. It's a fantastic wake-up call. The circumstances that lead up to the arguments are simplified, but the emotions are raw. I repeat, time will be very kind to this movie.